My apologies in advance if this question has been posted before (in all likelihood it has millions of times...), but let me ask the savvy on this forum what the max bet amount is allowed on Pinnacle on NBA matches.....and basketball in general....(??). For instance, would 30K EUR be too much on an average regular season match?? If so, how to go about betting such a large sum?? Also, would Betfair accept large bets on average basketball matches without limiting the winner? Pinnacle don't limit winners.Their basketball limits are dictated by the markets.You should be able to bet about 5.000 Euro on a top US game in one bet on the day of the game.If you were to bet the limit,they'd adjust their odds,but they wouldn't prevent you from betting more on the same team [ I'd advise waiting a few minutes for the market to absorb your bet]. 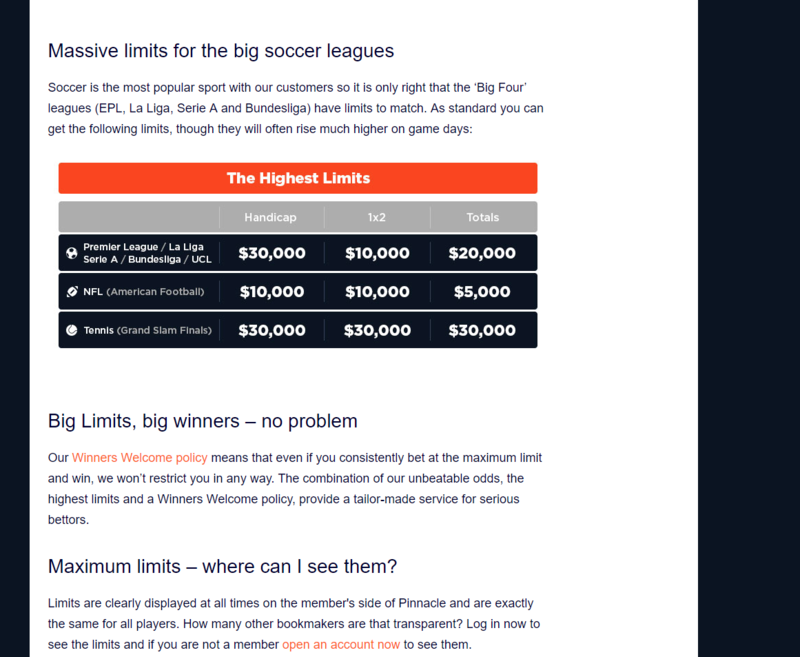 Betfair do limit winners on their Sportsbook.I don't know whether they'd limit you on a particular game.Having said that,they are pretty good at accepting bets at fair market odds where they can hedge.I don't know what their basketball limits are.The liquidity on basketball of their Exchange looks pretty poor,as I am writing this. Last edited by quincunx; 10-22-2018, 01:03 PM. I would have thought that Pinnacle would be your better option of the two. @ quincunx If I gather correctly, after placing an initial bet of cca. 5K EUR, I should wait a few minutes and then be able to bet the same amount again...(?). How many times can I repeat this "procedure" until they "shut me out"?? I don't know whether,or when,they would shut you out - sorry.Let me explain how things would probably work.Suppose Pinnacle were betting 2.00 team A,1.92 team B,and that this was pretty much in line with the market.You bet their limit on team A.They then go 1.94 team A,1.98 team B.This makes them top market offer on team B,and worst offer on team A.So people start to bet team B with Pinnacle,while people looking to back team A bet with other books since their offer is better.After a few minutes,Pinnacle will have taken enough money on team B to balance out your bet on team A,So then their quote on team A would probably recover a fair bit,and the movement in the odds would depend on the whole market's ability to absorb your bet,rather than just Pinnacle's. Last edited by quincunx; 10-24-2018, 09:39 AM. I somehow was under the impression that Pinnacle would be fine with large bets on an average basketball match and by "large" I mean definitely over 10K EUR.....what are your experiences with this?? Welcome knightly. Glad to see you found your way onto our site. With some of the highest limits anywhere Pinnacle is a solid book to play at. Pinnacle's maximums only went as high as around $7,000 on top US basketball games around 9am EST when I checked.I'm guessing they'd get higher closer to the start of games. Tried out placing 12K EUR on a NBA match with Pinnacle - went fine. Another question - would Betfair be fine with 5-10K EUR/basketball match, especially in the long run?? Will they limit winners?? Any suggestion/commentary is most appreciated. Don't know.My account with Betfair's sportsbook is limited on certain things.On others,where there is a big, liquid market like Premier League matches,they will still take decent bets.So my guess is that they'd keep taking bets from you - even if you were winning - as long as they could hedge them profitably.Don't know what their limits are,but they are owned by Paddy Power so probably quite decent.